Don't fret on the price. Convenient and ease is the best way to explain. I love the Simplehuman custom fit liners, sure they cost more than ordinary trash bags, but these don't rip and they fit perfectly without bunching up in the can or having to tuck excess away to make them look presentable. PERFECT. Bags fit perfectly. Nice construction. Very durable. Kinda need these if you have one of the Simply Human trash cans. They fit, period. And others don't. So you can use the trashcan to it's fullest capacity. The wrong size bag was shipped to me. It is too big for my simple human trash can. Very uncomfortable to use! And I spent about $70 or $80 on it. I love my rectangular steel bar trash can and I recently reordered liners. They are durable and don't leak. My order is shipped the day I order and receive them quickly. I also love rhe charcoal inserts. Love, love your products!!! I originally ordered the rectangular steel bar trash can. The quality and style are amazing. Great warranty! I have matching stainless steel appliances. I plan to build 3 new houses and will include simple human products in them. Also will gift my mother with these great products. I reorder liners @every 3-6 months. I also order charcoal filters. Fast shipping!! I love your product line. 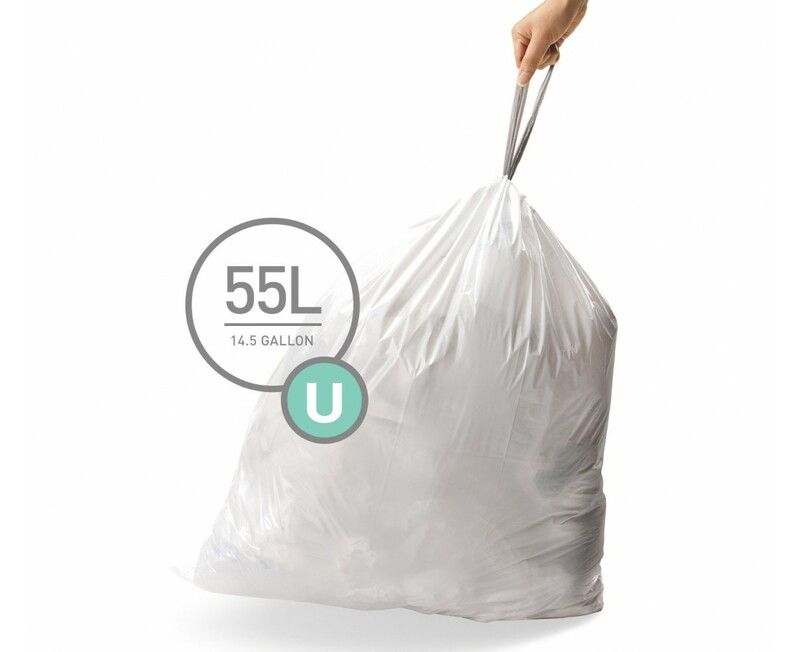 Well made,dependable, size is large enough to allow a whole days worth of trash with no odor. The liners are totally made for the product. However, the price is easily 5 times.that of all other liners. The bin liners fit the bin perfectly. they are easy to put in and remove when full. We live 3/4 mile from the bin collection point so they go in and out of a trailer - they are very strong and do not tear or split, even when over full. These work fine with the simplehuman can. They fit well and are of good quality material. I absolutely love my rectangle steel bar trash can. Everyone raves about how stylish and the size of it. I like the sleek,clean look, functionality, and the fact I can order online the bags,charcoal filters and all other accessories.We are going to build another home ,"simple human" WILL be in it and in my adult childrens' new homes as well. I also gift their products.My can is in my kitchen.I don't know how I lived without it before now. The large step bar can is very convenient. It looks nice and works well. Well constructed and easy to use. The u can liner is the only liner to form fit this can. I wish they sold the liners in bulk rather than in lots of 20 as I like having them on hand and only reordering once or twice a year. So, please make a bulk (50+) pack for this liner to make things easier and cheaper (hopefully) per bag. These are a perfect fit and are very strong.